From 5 to 30 April, French restaurant La Brasserie at The Fullerton Bay Hotel will be presenting a special menu of five dishes that feature Yukimuro Snow-Aged Wagyu Beef from Niigata, Japan. The menu, which is called The Art of Yukimuro, boasts an assortment of beef dishes prepared using traditional French techniques, highlighting the special flavor of the prized Japanese beef. What makes the Snow-Aged Wagyu stand out is the process behind it. The ancient 200-year-old method of yukimuro, which uses snow as natural refrigeration, was perfected by Mr. Uono Takashi and utilized it to store and age beef in specially constructed buildings designed to hold large amounts of snow. What results from this method is constant humidity and temperature ranging between 0 and 5 degrees celsius, allowing the meat to retain its moisture as it ages for 30 days, resulting in rich marbling, tender texture, and deeper flavor. The Art of Yukimuro meal starts with three appetizers that beautifully highlight the Snow-Aged Wagyu's unctuous texture. 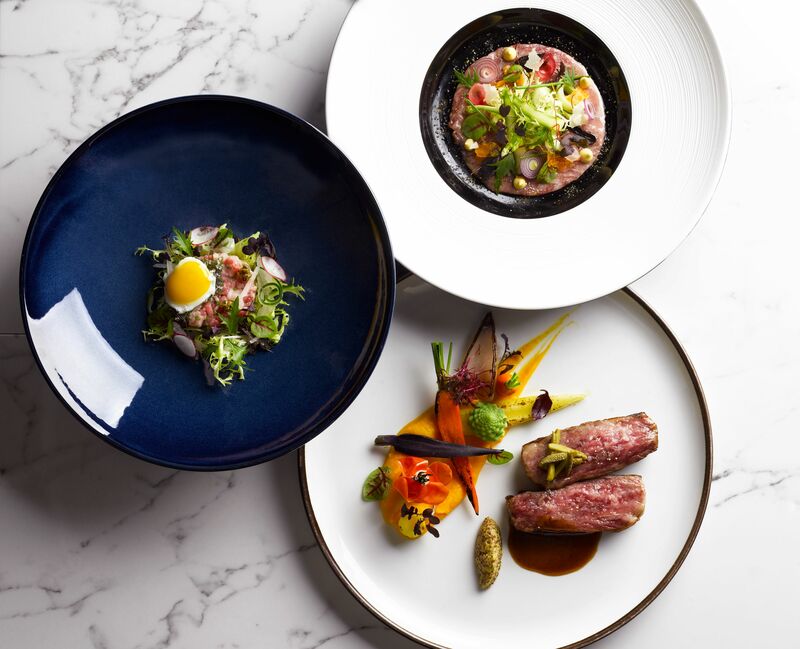 These include The Smoked Snow Beef Carpaccio with shaved asparagus salad, black garlic, and cured egg yolk, followed by the Truffled Beef Tartate paired with a sunny-side up quail egg and Nashi pear salad. 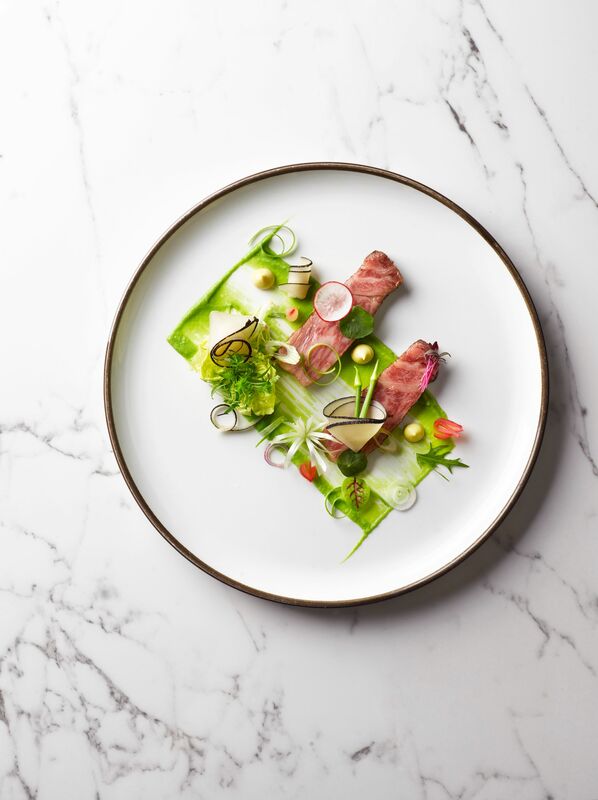 Finally, you have the Snow Beef Tataki that's lightly seared and accompanied by pickled pear onions and black radish, which lend zesty flavors that helps cut through the richness. Rounding it all up is a choice between the A4 Snow Beef Striploin or the indulgent A4 Snow Beef Ribeye. The exquisite cuts are prepared using the Josper grill with applewood, resulting in a smoky, buttery finish. The steaks are served with an assortment of sides, which include Yuzu Butternut Purée, Truffle Potato Mousseline, an assortment of seasonal vegetables, and your preferred sauce. The steaks also go well with La Brasserie's famous mustard selection, with the truffle mustard being our favorite.